We provide a combination of user centric, strategic sourcing tools that help organizations generate cost savings. Our tools work together to simplify and streamline your strategic sourcing process. Cloud hosted e-Sourcing software that automates the collection of quotes and Information from suppliers. Reverse online auctions enable real time, dynamic bidding between suppliers for maximum cost savings. Single electronic repository for all documentation, eliminating the inefﬁciencies and risks associated with standard paper-based contract management. Gathering vendor capabilities can be challenging. Our RFP software takes you step by step through the requisition process and enables you to aggregate the data you need in a format that is easy to understand and share. Online auctions are an integral part of the strategic sourcing process. Whether purchasing goods or services, a few items or a few thousand items, ProcurePort’s e-auction tool can generate signiﬁcant cost savings and cut supplier negotiation time by 90%. Manage contracts all in one place. ProcurePort’s centralized contract management software delivers a consistent and proven methodology for securing and supporting documents. Quickly assess contracts that are up for renewal, as well as get alerts on expiring contracts. 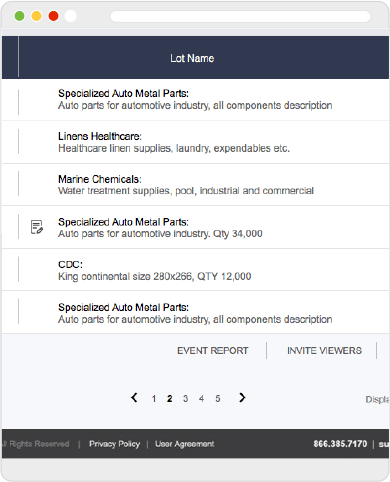 Need a custom auction platform or e-marketplace to ﬁt your organization’s needs? ProcurePort can help. ProcurePort has been developing custom auction software and other e-marketplaces across multiple verticals since 2000. Chat with one of our experts to discuss how we can help you with your Strategic Sourcing initiative. Its easy with the ProcurePort cloud hosted Strategic Sourcing Software.